Monday 24th July weather forecast heavy rain passing over the country with Wednesday the wettest day - oh dear. On Wednesday my son, Tim, was to celebrate at All Saints Sedgley his wedding in Hong Kong to Iris. As only a few family members had gone to Hong Kong for the wedding Tim wanted to have a local ceremony for those who were unable to go. As it so happened one of his friends Ali was to marry Rachel the previous week, so Tim also had friends from around the world. Tim had, therefore, a unique ceremony of international flavour. I was due to take Tim and Iris from All Saints Church Sedgley to Blakelands Wedding Venue in my 1938 Austin Ruby (how would a baby Austin accommodate the Bride and her dress? Simple bride in back groom in front). 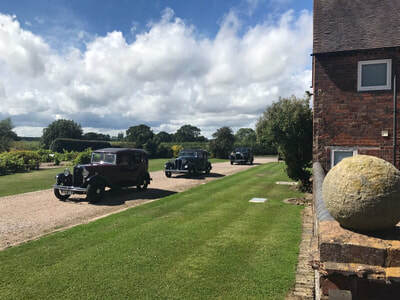 In thinking about transporting the guests an idea formed - would club members, particularly those with 1930's cars be prepared to offer a unique experience to the guests. Bear in mind that in HK owning a car is very rare and owning a classic car virtually unheard of, so a trip in a car that is 80 years old is beyond imagination. So come the day - rain. But at 12:00 o'clock rain stopped and fortunately stayed dry. Before the service we introduced Iris's family to my Ruby (they were unaware of what was planned for later). It is no exaggeration to say that Cutie (my Ruby), with scruffy bear wearing a bow tie, stole the show. So service over we came out with usual photographs and the secret started to dawn on the unsuspecting guests. Four drivers turned up in their cars Geoff in his 1933 Rover 10 Sports, Howard in his 1934 Daimler 15, Michael in his Lanchester and Petal and Rob in their Austin 12. And me in my (in comparison) little 1937 Austin 7 Ruby. We decided to put Iris’s Hong Kong family in one car namely Iris's uncle Kwok Sun and Aunt Ivy Kwok with Iris's Cousin (Fu Kwan). Kwok Sun was stunned and overjoyed at this surprise, the photographs tell the story. They joined Howard in the Daimler. Ivy live face-booked part of the trip back to Hong Kong! Sun could not stop thanking me! 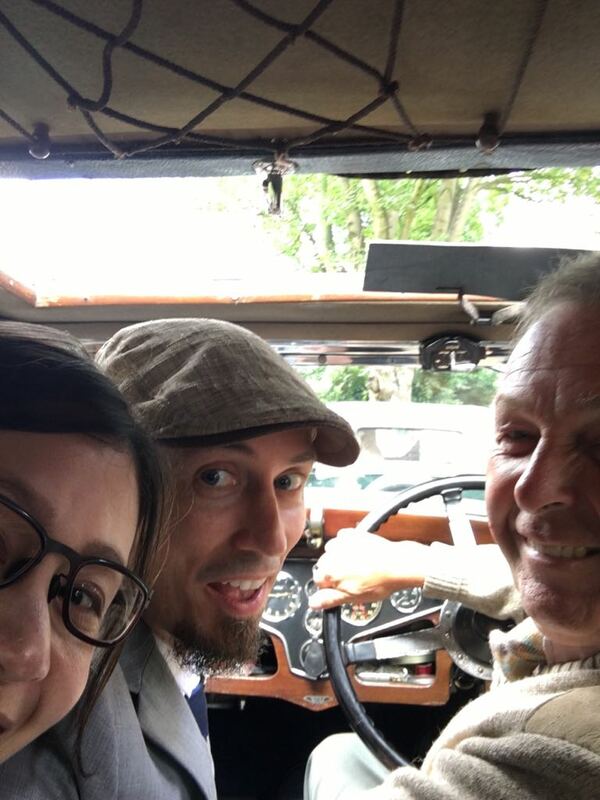 Dan from Canada and Rina from Japan (Hiroshima) were in Geoff's Rover "they were intrigued by the dashboard dials and mystified by the Free Wheel Device" – Aren’t we all? "awesome" was a later comment. Ali in Michaels Lanchester – “unforgettable a unique never to be repeated experience”. Brian from mainland China and Jacko from Hong Kong in Petal's Austin. Comments included wow is this car really 80 years old, never been in anything like it before and can you go very far in it? Another wow on hearing of the trips made. Comment from Petal “they were so excited to be actually going in an old car as it was a unique experience very different to Hong Kong. So we pulled out and started our trip - look at the video I have asked Chris to post online. Iris and Tim in my little Ruby leading all these distinguished cars (for those in the know Cutie has been rather poorly but is now revitalised following major surgery). A sentence not heard very often but overheard was that "the little Austin was going too fast!" Keeping in convoy was not easy with moderns (particularly one idiot) sneaking in at junctions. 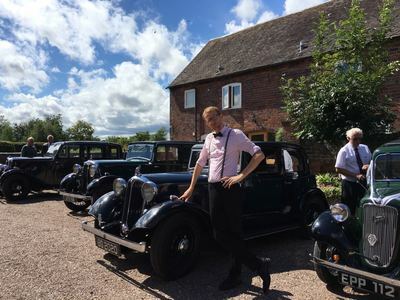 However, as Simon (son number 3) was filming at the Wagon and Horses on the Bridgnorth Rd I pulled over beforehand to reassemble. See second video and introduction photo. We appear to have attracted a tailback! 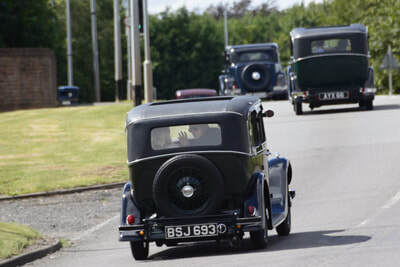 So we arrived at Blakelands in convoy being filmed by the professional photographer – film awaited. Many thanks to Geoff, Michael, Howard, Petal and Rob.